There were some dignitaries at East Hampton on Wed to recognize Kevin Reich becoming a Paul Harris Fellow and joining the Paul Harris Society. Paul Mangals, the Governor, somewhat lame duck, and Jim Satterwite were present. Red did his usual fine job making Kevin a Paul Harris Fellow without a pin or a certificate. Paul and Jim took care of the Society. Kevin then presented his plan for next Rotary year which was agressively conservative. We will have a great year. The Speaker at the Branford RC was the President of the local Muslim Society and gave an overview of Islam and of Muslims. There was some discussion of why the world seems so different from the principles of Islam, which are pacific and respectful of others. This was quite an enjoyable meeting. There were six contestants at the Semi-Final of the Four Way Test Speech Contest. They were all very good and two were chosen to go to the District Assembly next week, April 1, 2017. The second photo below is of Rachel the competitor from East Hampton. She did a great job but was not selected to go to the Finals. East Hanpton Rotary club had a St. Patricks Day celebration a week later. We had about 40 members and guests. There was a raffle which gave money to Project Graduation and Alan's project in Honduras. Ted and Barbara prepared the meal and club notables served it. A good time was had by all. A lot of effort goes into training the President of every Rotary Club. Since we have a new President every year training the new person is important. It's also valuable for the person because the leadership training help you in whatever you do. We had training March 9 to 11 in Framingham, Massachusetts. It was great with lots of great speakers and good discussion among the Presidents to be. There were 344 President Elects from 8 Rotary districts. This is the large ball room but there were lots of break outs with 15 to 20 President Elects. 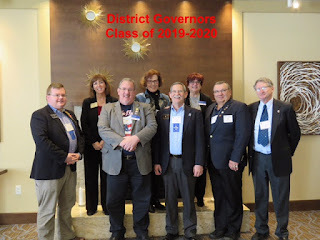 Some of the folks from our District including the incoming Governor Trish Pearson in the middle. And there were a bunch of college students interested in Rotary(Rotaractors). They met each other and talked about how they could make more stuff happen. And these are the District Governors for 2019-20 from the 8 New England districts. I don't know if this makes sense feedback is welcome. 1.So the process for choosing award winners must be "fair to all concerned" and the award winners chosen must be in truth: the most deserving. 4. Only give the awards when they are clearly special and have something to teach. 5. It is often said that "it is disappointing that so few clubs apply for awards. However there is a problem. Suppose all 60 clubs applied for an award. Now there are 59 non winners sll of whom have spent a few man hours preparing their submital for the award. Those are hours that could have been spent on projects or fundraising. It is clear that the winner is positively motivated but if the non-winners are not positively motivated then the award process is not bringing value to the clubs as a whole and to our District.